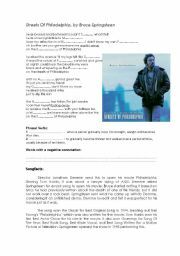 A gap-filling comprehension exercise to be done while watching the introduction to the docu-film "Super Size Me". It can lead to discussion about fast food. Hope you enjoy it! A good song to work on verb tenses and to introduce the third conditional. It can be used with advanced groups to teach inversion in conditional structures. I strongly recommend you to watch the videoclip of this song with your students. 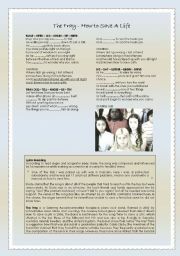 It´s really moving and useful to start a discussion on teenagers´ problems and how to face them. A useful song to introduce the topic of AIDS in class. Practice on filling the gaps, words with negative connotations and phrasal verbs. Hope you enjoy it! 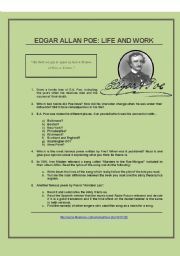 Edgar Allan Poe, "Murders on the Rue Morgue"
This is a worksheet related to a treasure hunt -the link is on the worksheet-. Students have to find information in different websites about Poe and "Murders in the Rue Morgue", which was the book they had to read. It´s a good activity to be done as an introduction both to the author and the story. Hope you enjoy it! 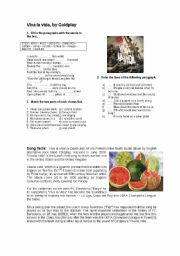 A nice worksheet to work on the lyrics of "Viva la Vida" with various song facts.